The shockwaves are still making their way through the hockey world. The Columbus Blue Jackets are taking the league by storm as they stand alone at the top of the league standings. Almost everything has gone right for the Jackets this season. That’s something they are not used to at all given their grim history as a franchise. Jackets fans probably don’t want to be reminded but for those who need to be refreshed, it’s time to review. 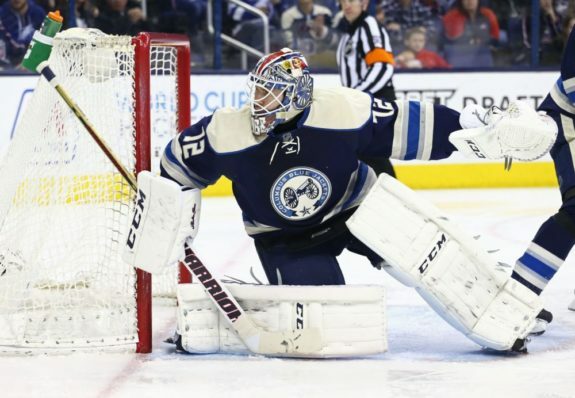 The Blue Jackets were consistent bottom-dwellers of the NHL, usually selecting in the top-10 of the NHL Entry Draft each summer, but many of their draft selections turned out to be busts. Without much talent around them, their best players struggled to produce. There was no true team identity and no big free agent wanted to sign a contract to play in Columbus. The Blue Jackets entrapped themselves in a losing culture and wouldn’t break out of it until their first playoff appearance in the 2008-09 season. However, the Blue Jackets would return to their losing ways by following that first truly successful season with three consecutive seasons with a losing record. In July 2012, the Blue Jackets traded away their captain and franchise player, Rick Nash, to the New York Rangers in their first attempt to rebuild the franchise. The trade preceded the lockout-shortened 2012-13 season, one in which the Jackets nearly snatched a spot in the playoffs after winning eight of their last nine games. That final win of the regular season put them in a tie with the Minnesota Wild for the last wild card spot but Minnesota held the tiebreaker over Columbus, which propelled the Wild into the playoffs over the Jackets. That late-season run by the Jackets seemed to have sparked the franchise in their final year in the Western Conference. The following season — their first as a member of the Eastern Conference — the Jackets made the playoffs for the second time in franchise history. They went head-to-head with the Pittsburgh Penguins in a playoff series that would light a fire in the rivalry between the Metropolitan Division opponents. The Penguins won the series in six games and all games except for one were decided by the same 4-3 score. The Jackets picked up their first two playoff wins in the series and proved worthy of their postseason berth. Even though the Jackets lost the series, they put on display a “beware of Jackets” sign for the rest of the league to see. In the 2014-15 season, the injury-ravaged Jackets couldn’t string together back-to-back seasons with postseason visits. But similar to the 2012-13 season, the Jackets finished very strong. As a team eliminated from playoff contention, they could’ve rolled over and played dead, but the Jackets closed out the year with an astounding 12-0-1 record, again reminding the league that they mean business. A remarkable ending to the previous season left Jackets fans begging for the next season to roll around. A number of NHL experts were picking the Jackets to not only make the playoffs, but perhaps make a run for the Cup. Jackets fans bought in and they were ready. However, a devastating collapse in the final minute on opening night against the Rangers crippled the fan base and the team couldn’t recover. The Jackets would lose their next seven games to open the season 0-8. 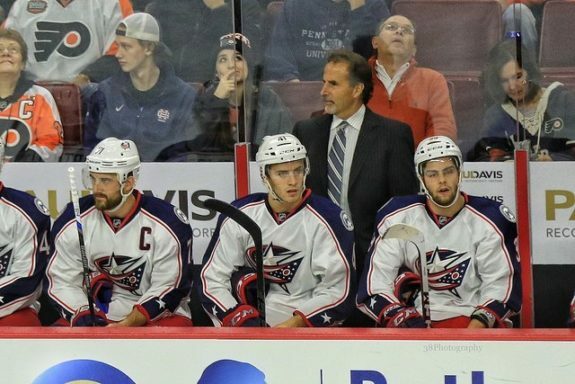 They fired their head coach, Todd Richards, and hired John Tortorella, the fiery individual who had coached the Tampa Bay Lightning to the Stanley Cup in 2004, but arguably arrived in Columbus with a bit of baggage. After basically eliminating themselves from playoff contention through the first eight games, the Jackets needed to be revived. He brought the team back to its feet, posting a 34-33-8 record after he was hired as the new bench boss. It’s evident that all Blue Jacket players have bought into Tortorella’s system as they are playing at the highest level in club history, but Torts hasn’t transformed this team on his own. It is important to note that ever since the transition away from their former franchise element in Nash, they have collected many key pieces that exist on their current roster. Sergei Bobrovsky, the winner of the Vezina Trophy in 2013, arrived in Columbus from the Philadelphia Flyers in June 2012 in exchange for multiple draft picks. He owns the league lead in wins with 26 this year. Assistant captain Brandon Dubinsky came to Columbus as the main piece on the Rangers side of the Nash transaction. Even though the point total is down a bit this season, he still remains a strong leader on and off the ice for Columbus. Captain Nick Foligno was also acquired in July 2012 in a deal with Ottawa. He set a career high point total in 2014-15 with 73. And after a down year last season, he is back on track as he is on pace to nearly equalize that point total from a couple years ago. Last year’s team leader in goals, Brandon Saad, was acquired by Columbus in an eye-opening offseason trade with Chicago in 2015. He is on pace for another 30-goal season and 60-plus points through the first half of this season. Top defenseman Seth Jones was acquired from Nashville in a one-for-one hockey trade last season for Ryan Johansen. The 22-year-old has matched his 20 points from a year ago and leads the team in time on ice. His stellar play this season has earned him a spot in the 2017 All-Star Game. Turning to the draft, Columbus used first-round selections on Defenseman Ryan Murray (second overall, 2012), Center Alexander Wennberg (14th overall, 2013), and rookie D-man sensation Zach Werenski (eighth overall, 2015). Murray is 23-years-old and improving as a solid two-way blueliner. Wennberg is taking huge strides as a two-way centerman in an effort to become the Jackets’ #1 center. Werenski is only a rookie but not playing like it. He leads all rookie defensemen in most statistical categories including assists (20) and points (26). All these big trade acquisitions and draft selections were added to a strong mix of mostly young talent, but also veteran leadership, which makes it easier to understand why this team has overcome the rough past in a record-setting 2016-17 season.